The Mongol empire was founded by Genghis Khan in 1206. Present-day Mongolia is a democratic state in eastern Asia huddled between Russia to the North and China to the south. The capital is Ulaan Baatar, where almost 40% of the whole population lives (on a total of just more than 3 million people, making it one of the nations, if not THE nation, with the lowest population density in the world). Most of its territory is covered by steppe, with mountains to the north and west and the Gobi desert to the south. Around 30% of the population are nomads who live off livestock farming. 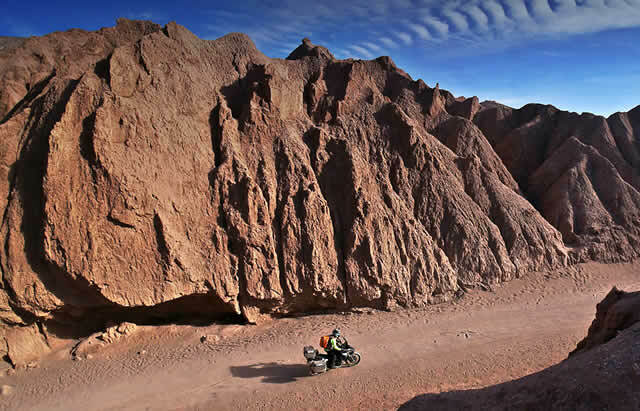 Mongolia is one of the most sought after destinations by adventure-loving bikers. Those who have experience, time and resources decide to reach it overland. The alternative is the typical flight + locally rented bike (Mongolia has no access to the sea, consequently it is not possible to have your vehicle sent via cargo ship). Mongolia has a varied territory, with mountains in the west, great forests of pines and lakes in the north, plateaus in the east and the famous Gobi desert in the south. The whole central area of this immense country is steppe. To enter the country you need a passport with at least 6 months of residual validity. Since January 1st 2016 it is necessary to have an entry visa also for short stays for tourism, as the Mongol government has not extended the exemption measures adopted in 2015. To obtain a visa and for any further information, Italian bikers must contact the Mongol Embassy in Rome (e-mail: italy@mfa.gov.mn – Phone: +39 -06 -8540536. The cost varies according to the aims of the trip, the number of visas requested and the administrative taxes applied by the issuing Embassy (for a tourist visa the cost is about 60 euros). Attention: the visa must be used within three months from its release date. In case of urgent need, the visa can be obtained directly at the Airport of Ulaan Baatar or at the train stations on the border with Russia and China, paying a tax of around 50 US dollars. Our advice is to reach the country already with a visa. If your stay is longer than 30 days, within 7 days from your arrival as a foreigner you must register (paying around 12 US dollars) at the Immigration, Naturalization and Foreign Citizens Bureau: in Mongol this office is called “EBMONT” (Erigni Burtghel Medelin Tuv) and is situated on the second floor of the Police Department of Zuun Ail in Ulaan Baatar. Visitors who are not in the capital must register at the local Police station. Failure to register entails fines from 100 to 300 US dollars. The visa, including the tourist one, can be prolonged up to a maximum of 30 days presenting a request at the aforementioned Police Department. If you plan to reach Mongolia overland,you obviously also need an entry visa for China or Russia, which can be obtained at the respective Embassies or Consulates in your country. If you are thinking of entering Mongolia via air and then rent a bike, be aware that you will not be able to cross the country’s borders, as the Consulates of China and Russia do not issue visas to foreigners not living in Mongolia. Currency issues. You are not allowed to leave the country with a sum of money greater than the one declared at entry. The US dollar and the Euro are the favoured foreign currencies, accepted in the capital also for small commercial transactions. Credit cards are not widely accepted (just some big hotels and a few restaurants and shops), and are almost unheard of outside the capital. An international driver’s licence is required. You must also have your valid national licence. The international conventions that govern the subject allow two distinct driver’s licence models: the ‘Geneva 1949’ model and the ‘Vienna 1968’ one. For Mongolia you need the second one; it is valid for 3 years (always within the validity limits of your national licence). It is possible to enter the Mongol territory with your own car of motorcycle, provided you have the necessary authorisation, to request in advance at the country’s Diplomatic authorities abroad (who will then request it at the Immigration Department of the Home Office). To obtain it you need to pay a tax. The internal road network is not very developed. Mongolia has about 1,800kms of railroads and less than 2,000kms of asphalt roads. Outside the capital you must drive really carefully as accidents are very frequent, and the percentage of lethal ones is rather high. You can reach Mongolia via road with your vehicle, or using the railway that links from north to south Russia to China. The problems of old trains on the line seems to have been overcome. Connections to the capital are active from Moscow (with Airflot), from Berlin and Hong Kong (with the national carrier MIAT) and from Beijing (where all major airlines transit) with Air China and MIAT, and finally from Seoul with Air Korea. Road conditions are awful, with many potholes and long off-road parts. This does not frighten the nomads, who use with pleasure the motorbike as an alternative to the horse, carrying their wives on the back seat. we are talking of small bikes (150cc) quite reliable and easily adjustable. Road signs are in Cyrillic. If the various tourist areas of the country, outside the capital, are safe for tourists, the crime rate in Ulaan Bataar is rapidly rising at the expense also of foreigners. Alcoholism has reached the point where it’s a social disease, especially among men, and can be translated into shows of xenophobia and hatred towards the Chinese. Verbal aggressions towards mixed couple are frequent. The phenomenon is mainly linked to the social crisis which has accompanied the economic transformation of the country and the loss of traditional cultural references. The airport, markets, state storehouses, shopping malls, public means of transport and tourist areas have become a hot spot for muggers and petty thieves. It is advisable to guard your valuables. Pay attention to where you leave your motorcycle and especially your luggage. It is best to avoid leaving helmets or easily removable bags in plain sight. On the Trans-Siberian muggings and aggressions are on the rise, especially in the border areas, where bands of smugglers operate. By plane frequent loss of baggage is reported in Russia and China. If you plan to hire a bike in the capital travel on the plane with your technical jacket and keep the rest of your clothes in your hand luggage. In the case of problems with the local Police Authorities (being held in custody or arrested) we recommend you inform your Embassy (the Italian one is available 24/7 at the following number: +97694011330). In the country sexually transmitted diseases are increasing and some cases of rabies and fowl plague have been identified. There are also infective illnesses such as meningitis, tuberculosis and hepatitis B. Notwithstanding the situation no vaccinations are obligatory. If you decide to venture by bike with Mongolia as your destination, we recommend (after talking to your doctor) vaccinations against hepatitis A and B, diphtheria, tetanus and polio, cholera. Avoid eating eggs and raw or not-well-cooked food. Hands must be washed many times a day with disinfectant soap. Given the difficulty of finding medicines produced in the west, we recommend leaving with a supply of medicines adequate to your needs. In Mongolia health care is not one of the best in the world. In the capital there are good quality private structures (among which there is SOS-Medica – in partnership with International SOS, the world leader in the field of health care and safety for travellers), but outside of the metropolitan area it is difficult to find medical staff with a European preparation, and especially with a knowledge of English (training is mainly from Russia). Hospitals in the capital almost always require immediate payment for their services. We strongly recommend full health insurance coverage, covering the cost of treatment, hospitalisation and possible repatriation or transfer to another country. TIME ZONE: +7 hours compared to Italy, +6 hours when in Italy Daylight Saving Time is in use. Languages spoken: Khalkha Mongol (Mongolian). Russian is widespread, especially among old people, less common German. English is spreading among young people. Telephone: Prefix for Italy: 0039 prefix from abroad: 00976 The local operator is called Mobicom (ask your network operator if they have roaming deals with this company). It is possible to purchase local rechargeable cards: they can be found at the airport and in the capital. Coverage is limited to few urban centres. Internet cafès are very common. Do not leave without a GPS system. Travellers arriving in Mongolia with their bike surely have the experience necessary to face this country and also the appropriate accessories and clothes. Those who hire a bike locally, with the intention of travelling alone, surely cannot carry their hard cases or the engine guard. But they can leave with a touring outfit, helmet, adequate boots and gloves, a GPS (fundamental. The best one in Mongolia is considered the Gher Position System. If you get lost ask the locals…they are better than any gps), a pair of soft bags with respective universal fixing straps, a first aid bag, tool kit and tyre repair kit. At the capital’s market you can buy a tank for water and one for petrol. If you taking part in an organised tour part of your personal equipment will be carried in the support 4×4 truck. The few petrol stations are a problem for bikers, who must make sure not to remain dry. The cost of a litre of petrol is about 0.70 euros. During winter there are interruptions in the supply of energy (both electricity and heating) also in major cities and hot water can go missing in spring even for long periods…inconveniences that do not dampen the spirits of people who love adventure on two wheels. The best season to plan a trip to Mongolia is anyhow summer, especially due to the climate, making transfers and riding easier. In winter temperatures can reach -40°. Tendentially Mongolia is a country with the highest altitudes of the planet, cold and windy. The climate is continental, with long, cold and rigid winters while during the summer months the dry and healthy climate reaches 25-30°C. Time is a factor to seriously consider. Especially if you have a plane ticket with a fixed return date. Average speed, given the road conditions, is rarely above 50km/h, so you must plan your trip carefully as you will find yourselves in a territory five times bigger than Italy. One of the most popular regions is that of the mountains, west of the capital, towards the border with Russia (where the city of Olgij is), where the reference point is the Altai Tavan Bogd National Park, with the highest Mongolian peaks (Hujtnij peak reaches 4,379 metres), glaciers, lakes and many waterfalls. A real dive into what appears to be unspoilt nature. Its paths, all dirt tracks, can be done with a bit of care also with the small bikes rented locally. If you are good at horse riding do not miss the chance to do so in the country’s central steppe. This is also true for the rental of a Mongol tent where you should sleep at least one night (the cost is less than 50 euros). Another interesting area to include in an itinerary towards the north-west is the huge basin of lake Uvs Nuur: One of Unesco’s world heritage sites. There are many possibilities. in the main cities there are small operations managed by Mongols and Westerners. Here a few of the options discovered on the net. In Olgiy, bike rental and logistic support. www.backtobektravel.com. Possibility to hire 200cc Kawasakis at a cost of about 100 US dollars a day. Possibility to create a personalised itinerary with the help of the owner (Bek). Organisation present all over the world. In the Mongol capital it offers bike and scooter rental. The vehicle fleet apparently is made up of perfectly serviced models. It is not clear whether use is limited to the metropolitan area and its surroundings. Daily prices range from 37 euros for the small 150cc Yiying Shieray to 106 euros for a Suzuki DR650. For further information you need to fill in a form on their website. There is also an offer for a 9-day tour with English-speaking guides, route of medium difficulty. you travel in the saddle of a Yamaha WE250F and KTM 450 EXC. Description: Mongolia Khorgo Volcano & White Lake. It offers an 11-day motorbike tour that touches central Mongolia and the Gobi desert. There are no group departures, only individual, on any date. Prices, inclusive of round flight, bike rental (200/250cc), accommodation, technical support, etc. are to be requested directly at the agency, sending an email at the website www.ntbs.it or calling NBTS Viaggia of Turin at +39 011/0519575. European organisation with branches in Germany, UK and the Mongol capital. For information on their motorbike tours and calendar you can visit the website www.motorcyclemongolia.com. Their motorbike fleet is made up of slim KTMs 450 EXC. Their tours last from 6 to 120 days and start at 1,785 US dollars.